A week or so ago an old friend of mine come up to me and asked if I knew the secret behind human existence. For some strange reason he knew that I knew about these sort's of things, and he was wondering if I could tell him a little bit more. In turn, I looked down on my old friend and coyly uttered the phrase, 'Lies and Safety Pins'. Want to know why? Then please check out this conversation I had with an amazing cosplayer, called Evie Evangerlion. 1) What are your own origins, Evie? Plus what path did you take in life before you got to where you are today? When I was in 8th grade I first started getting into anime and more nerdy things. I started cosplaying in 2011. It seems strange to think about how I got to where I am today. I think one of the biggest reason I got to where I am, though, was my first trip to an anime convention in 2006 when I got to see cosplayers for the first time in person. Plus of course the friends I've made in college that showed me how to get started with cosplay. 2) What are the most persistent comments you've received from your followers? I get a lot of comments about my appearance, mostly good. But my favorite comments are the ones that talk about the costume or my characterization. I really love to hear what people think of the work I put in to the costume and acting like the character. 3) What is your ‘regular’ job? And does it in any way shape or form aide you as a Cosplayer? I work in a craft and fabric store as a cashier, and it helps with my cosplay because I get a little discount and can see when new (helpful) products come in. 4) How did your friends, family, and work colleagues first react to the news that you like to cosplay? Most of them were supportive, if not a little confused. My family is very proud of my ability to sew now thanks to cosplay, and they think the outfits are pretty, although they seem to think I over work myself when it comes to it. As for my friends, most of them enjoy conventions and cosplay as much as I do. 5) How do you decide what Cosplay costume to wear for a convention? And who makes them? I make most my own costumes, but there were a few in the past that I bought off of websites. As for how I decide on the character I am going to cosplay, there are a lot of things I take into account. I have a very long list of cosplays I want to do, and I normal go through that list and weigh the cost of material and the complexity of the costume and my skills. I try to pick costumes that push my skills a little so that I am always improving. 6) What have you learnt about yourself whilst Cosplaying? And were there any unforeseen obstacles you had to contend with? I have learnt patience! But as for what I have learned about myself as a person, well, this might sound unhealthy, but I find that I am more comfortable in costume than out of it. 7) What was the best / worst convention you ever attended? I enjoy smaller conventions a lot. So conventions like ConBravo and Con-G have been my favorites so far. As for the ‘worst’, I would say that I didn’t enjoy 'Atomic Lollipop'. Not really because it was a bad conventions, but because it was more of a rave / party convention with lots of dances and I was NEVER a fan of that sort of thing -- not even in high school. 8) What would be your dream Cosplay gig and outfit? Asuka Langley Soyru’s plugsuit, hands down! I really want to make / wear that plugsuit so bad, but I'm not at a level yet where I'm able to make it, and all of the good ones are over $1000, so it will be a while before I can get to that costume. 9) Has their ever been an outfit you just did not like wearing? And if so, why? I didn't enjoy my Poison Ivy costume because, ironically, it was itchy. 10) Do you have a credo you live by? Lies and Safety Pins, at least when it comes to cosplay. So there you have it, dear reader. 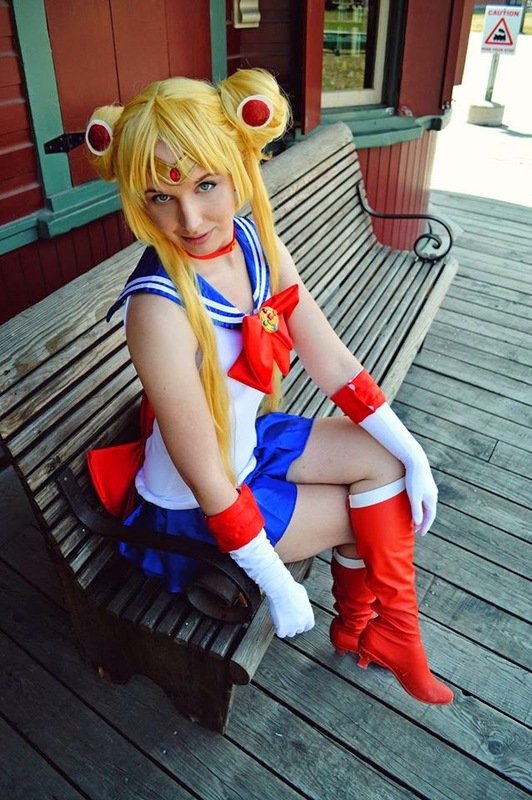 My mate Evie and her life as a cosplayer. When you have the time please check out her facebook page, her DeviantART Hub, and her twitter stream. Trust me. She's one hell of a nice lady.